Job figures in the US are tipped to be the best in 30 months ... US banks continue to bit the dust ... China puts the brakes on bank lending ... Japan is still in deflation ... BSkyB is expected to challenge an Ofcom ruling in the UK. Gas project on hold ... again: For the second time six months the Japanese group, Inpex, has postponed a final decision on the huge Ichthys LNG project off the Northern Territory coast. Inpex announced Darwin as the base for the project in late 2008, a year later it delayed the final decision until late this year or early 2011. Now according to reports from the recent Australian Oil and Gas Conference, it is now delayed until late next year. The first delay was ostensibly due to rising costs of construction, but oil industry analysts say it was more to do with the rapid emergence of an LNG glut in Asia thanks to the impact of the recession in Japan, Korea and Taiwan. The Inpex project is huge, media estimates put it at $A20 to $A24 billion, which would be the size of the North West Shelf. An industry informant says announcement of the delay is being held back until May to coincide with the presentation of Inpex's 2009 results in Japan. Easter fun: What would happen if they released the major economic figure of the month and there was no one there to trade off the result? Never happen, holidays mean no figures? Well not in America where the March employment and jobless data will be re-released at 8.30pm Friday, US time, just in time to catch the Easter buns and church brigade, instead of the market punters, urgers and their analyst mates. The jobs figures are tipped to be the best in 30 months, a forecast 190,000-200,000 new jobs are forecast. With no trading until next Monday the long Easter weekend could be very nerve wracking, so expect many investors to avoid going long over the holiday, just in case there's a hiccup in the figures. With just five out of 13 independents at 21st Century Fox, OfCom should insist on substantial board changes as a pre-condition before the bid can proceed. Some newspapers boosted their print circulations, according to the latest figures. And other media tidbits of the day. Mark Latham loves The Bachelor, Hedley Thomas smells a conspiracy. And other media tidbits. 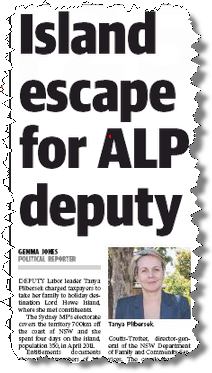 The Daily Telegraph has called out Tanya Plibersek for using taxpayer funds to fly her family to part of her electorate for constituent business -- although that is easily within the rules. So what did she do wrong then?